In an effort to develop stronger support for girls and women in sport, the Cincinnati USA Women's Sports Association has as a primary purpose to sponsor annually an awards ceremony to recognize, at the local level, outstanding achievement of female athletes and those who support them. Such recognition is important as it enables the athletes to realize their participation in sport is valued and respected, and it enhances community awareness and support. The association believes strongly in the valuable lessons and benefits that accrue from participation in sport. Examples include learning the importance of teamwork, respecting others for their strengths rather than focusing on their weaknesses, learning to perform under pressure, the importance of striving for a goal, experiencing how practice, repetition, and focusing on task produces excellence in performance. Such benefits are vital assets as women take their place in today's work place. The association believes that girls and women should have optimum opportunity to participate in the sport experience. Besides gaining in confidence, self-esteem and pride, girls who engage in sport are 82% less likely to get involved with drugs. They are 80% less likely to have an unwanted pregnancy and are three times more likely to graduate from high school. Physical exercise strengthens the heart, increases bone mass, and may lower a teenage girl's life long risk of breast cancer. FORT MITCHELL – On the tennis court hitting a double or in Starbucks sipping a coffee Emmy Kaiser is an athlete. “I get to do what I am best at,” Kaiser said. “I’m an athlete. It’s been a blast. Tennis is just a natural fit for me. Now, no one can be a true all natural. You have to put time and effort, if you didn’t you wouldn’t care. I say it takes a bit of both natural talent and putting a lot of time into it to be good when playing.”. CINCINNATI - A Cincinnati native and Mount Notre Dame graduate has been named to the 2016 Olympic volleyball team. Rachael Adams helped lead Mount Notre Dame to state championships in both volleyball and basketball. Her senior year, Adams was ranked the No. 3 recruit in the nation and went on to play for the University of Texas Longhorns, where she was named Big 12 player of the year in 2011. 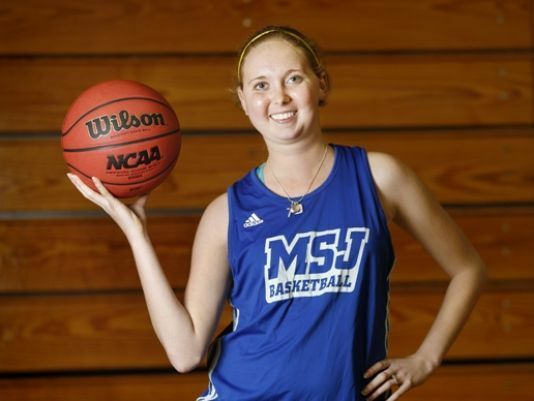 Lauren Hill, the inspiring college basketball player at Mount St. Joseph University, died Friday morningafter a battle with brain cancer. Her life was short, but the list of people the 19-year-old inspired is long. Legions of admirers took to social media to pay tribute to Hill. A five-tweet series from LeBron James was among the most touching.